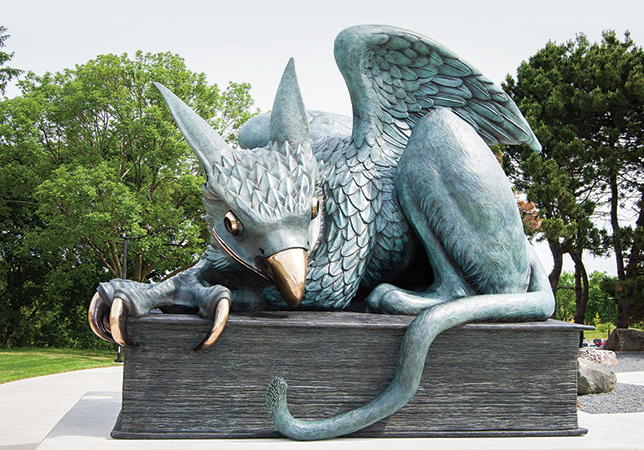 The University of Guelph’s Gryphon statue, with its impish smile. Photo by Amanda Scott. An 1,800-kilogram bronze behemoth with talons the size of your forearm – albeit with a charmingly inviting, impish smile – has welcomed thousands of students, parents and camera flashes since its unveiling at the University of Guelph last June as part of the university’s 50th-anni-versary celebrations. The statue, located at the south end of the university, is of a mythical gryphon, portrayed with the body of a lion and the head, talons and wings of an eagle. The university’s varsity sports teams are also called the Gryphons. The sculpture was designed by FASTWURMS, the artist duo of Kim Kozzi and Dai Skuse, both faculty members at the university’s school of fine art and music. U of Guelph MFA graduates Nicole Vogelzang and Dustin Wilson also worked on the $300,000 project, funded entirely by donations, primarily from alumni and student groups. The sculpture took six months to research and one year of production and creative work in the studio and foundry to complete.